Except the man is not palestinian. He’s Iraqi. A picture of a man from the city of Fallujah at the end of his fourth contract appears in the Falluja General Hospital smiling and a bullet planted in his head clearly, which sparked wide controversy among Iraqis. Some commentators commented on the picture as a “vehicle” through the “Alfotoshob” program, but according to “Arab.Net”, which was able to reach the owner of the picture, an Iraqi citizen Sheikh Mohammed Obeid Rawi. Al-Rawi said in a telephone conversation with Al-Arabiya.net that the picture was real. He was referring to the al-Haj Nazzal Mosque in the Nazzal district of central Falluja to perform the evening prayers, but as he passed through the street, clashes broke out between the tribal rebels and the Iraqi army. “It was only moments before my vehicle was hit by bullets from the Iraqi army. However, I continued my way to escape the clashes. I did not feel a pain in my head and a bullet was planted in it, but after stopping, I immediately went to Fallujah Hospital to get the bullet. 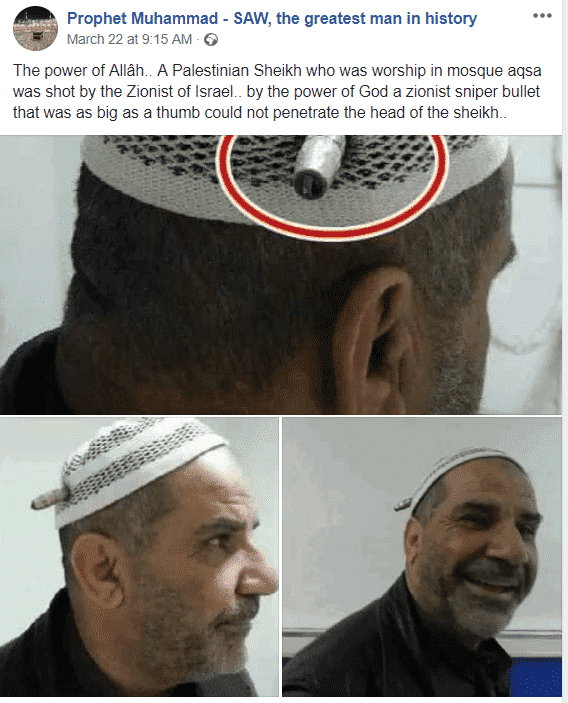 No doubt the administrator of the Prophet Muhammad – SAW, the greatest man in history Facebook page knew full well this had nothing to do with Israel or the palestinian Arabs, but decided to post it anyway. Because demonizing Israel and the Jews is far too important to let the truth get in the way.